Animals (Pets) and Showings Don’t Mix! If at all possible, take your dog out of the house during showings. Take your dog for a walk, or a drive. I did this with my dog when we sold our previous house – and it sold in two weeks for full price. (I also made sure it was vacuumed and cleaned every day; as much work as it was, it paid off.) If there is no one home during the day to remove the dog for showings, put your dog in doggy-day-care as an easier, albeit more expensive, alternative. The expense is likely to pay off in a quicker sale. When all else fails, put your dog in a penned-in, blocked-off area of the house, like a laundry room, basement, or outdoor dog run if weather permits. Or ask a friend to “board” your dog if you expect lots of showings and can’t be home to manage your pet. Reptiles and frogs are another story – I recommend “loaning” them out to a friend or relative (good luck!) or even locating a reptile “rescue” center. Nothing scares off buyers like a snake under glass – I was once unlucky enough to encounter a dozen snake cages in the basement of a house I was touring. Gave me nightmares about “lost” and “forgotten” snakes being left behind when the owners moved out. Noisy birds – especially large ones like parrots – look beautiful, but they leave a lot of droppings and can make you jump when they squawk, talk, or even a chirp. The size of the cages also interferes with the aesthetics and spacious feeling of any house. The very first house I staged belonged to people who served as a foster-home to rescued parrots, with two huge cages in the kitchen. Not exactly appetizing or peaceful. Every time a female guest walked by, one of the parrots made cat-calls just like a construction worker. Funny at parties, BUT. One last problem: I haven’t run into a nasty dog yet, but sellers should be made aware that there could be liability issues from aggressive animals that bite prospective buyers or agents. Stagers do NOT cover up defects! According to Barb Schwarz, founder of stagedhomes.com, an on-line article recently appeared stating misconceptions about what stagers do and don’t do. The article stated that stagers purposefully cover up problems in homes for sale. 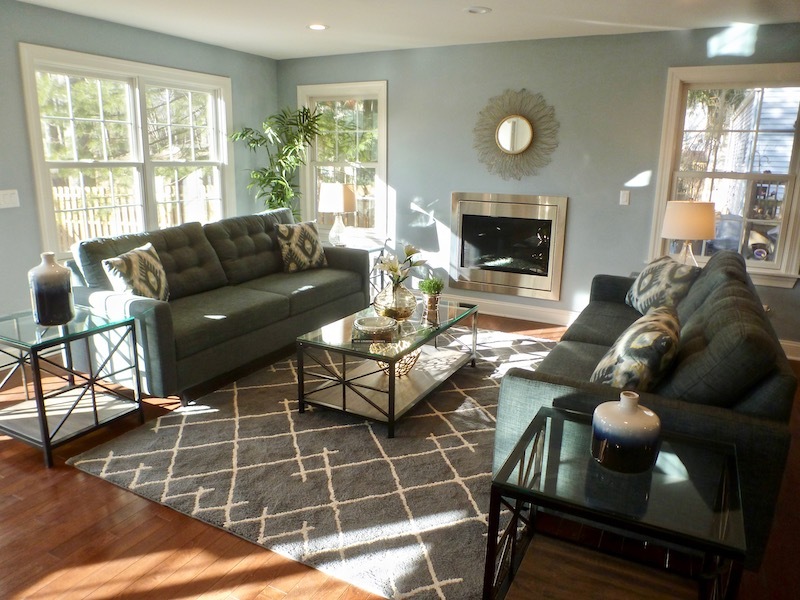 According to Schwarz, “the article further described how agents specifically should caution prospective buyers when they see a Staged home, and that ‘82% of buyers are likely to be distracted from important issues when they go through a staged home . . . 51% of respondents noted that staged homes often cover up real defects including structural damage. '” ASPs (Accredited Staging Professionals) do NOT cover up defects in properties, and hopefully other stagers who want to stay in business do not to this either. It goes against our code of ethics. Rather, our job is to highlight the positive features of a property through furniture placement, window coverings (or lack of), bringing in up-to-date accessories, and adding artwork or area rugs to “warm up” a space and create focal points. Yes, we also aim to draw a buyer’s attention away from things like a less-than-desirable view, awkward layouts, small rooms, and old appliances or fixtures, if the owner doesn’t want to spend money on updating the latter. A very big part of our job when we visit clients is to point out everything that needs repair, replacing, painting, and modernizing. It is, of course, up to the client to decide whether they want to spend the money and/or time on that, but I strongly encourage them to. Fortunately, I have been quite successful in convincing my clients to make needed repairs — I find clients who want me to do stagings are motivated sellers who want to sell quickly and get the most money they can for their property, so they are anxious to eliminate problems and potential buyer objections before their homes go on the market. However, if I had a home where the floorboards were water stained (or urine stained from pets), I would never cover up that floor with a rug; instead, I would tell the sellers they must get the floor sanded down and restained, or replaced as necessary, because if the house got inspected after a contract was signed — or worse, got to closing and the buyers discovered stained floorboards after a rug was removed — both I and the sellers would be accused of hiding a defect. I would never risk my reputation for a temporary “fix” that is really a cover-up. I would, in fact, make sure the agent and the sellers knew of the problem by putting it in writing to both and keeping a copy in my own files. My job is to help buyers view a house in its best possible light so that drawbacks that can’t be changed (view, noise, layouts, room sizes) are less obvious, but those that CAN be fixed and that might affect the value of a property are eliminated or made known to agents, sellers, and buyers. Just as with agents, stagers know that misleading buyers is a dangerous business that can get any of us in big trouble and hurt our reputations and referrals. It’s not worth it, and it’s just not the right thing to do.